How to determine lactate threshold? The determination of the lactate threshold is usually complicated, time consuming and often requires invasive blood samples, meaning also laboratory equipment. These tests usually involve discontinuous bouts of running or cycling where blood samples is taken between each bout. Field tests, such as the Conconi-test, to determine the lactate threshold do exist but their validity and reliability are questionable. To avoid the invasive tests in the laboratory and for you as user to be able to determine the threshold yourself, researchers are trying to determine the lactate threshold by finding connections to other parameters such as respiratory rate, ventilation, heart rate deflection and variability. It matters for your training! The specific point at which the lactate threshold occurs is individual due to genetics and physical condition. Especially, the training status has a great effect and you as an athlete are able to improve your lactate threshold. 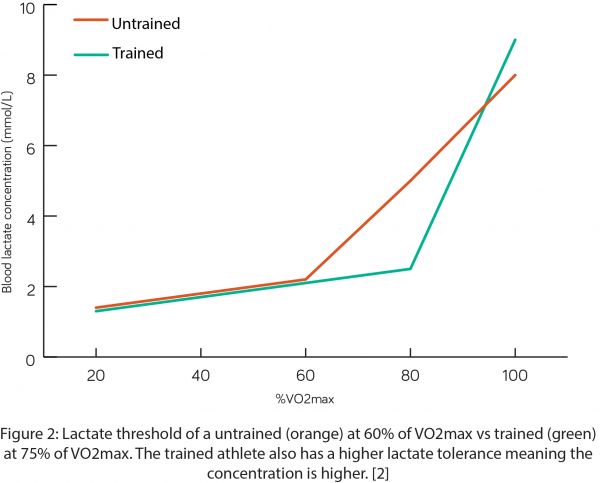 The appearance of lactate threshold will be at a higher intensity for a trained compared to an untrained individual which is shown on figure 2 where the blue line represents an untrained and the orange a trained person. However, the behaviour of the blood lactate concentration is similar between trained and untrained individuals. When you are training the right way, you will improve both your lactate clearance, lactate tolerance and energy production of the body leading to an improved lactate threshold. In other words: the physiological adaptations to the right training will improve your performance! So how can I use the lactate threshold to improve my exercise? Exercising at higher intensities than the lactate threshold has shown to be beneficial in terms of improving endurance capacity and lactate threshold but exercise at these higher intensities is impossible to maintain for longer periods. 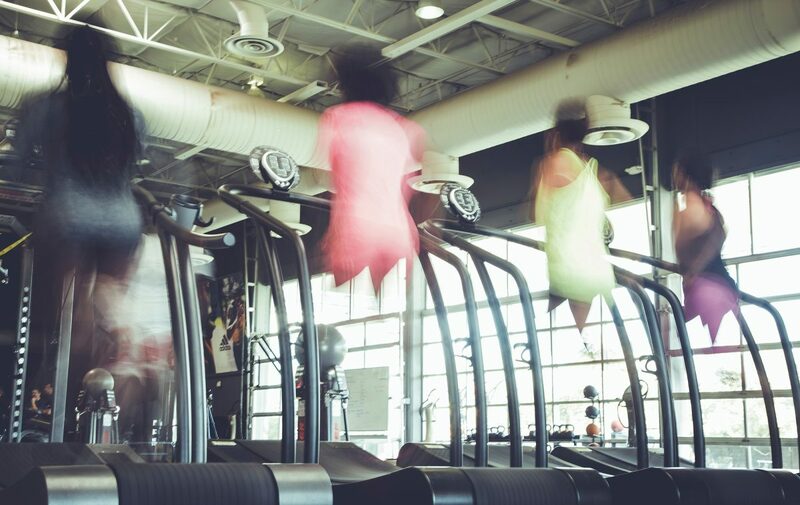 High intensity interval training (also known as HIIT) is the quick answer and designed to solve this problem. Short bouts of high intensity above the lactate threshold with rest or low intensity exercise in between have shown to improve endurance performance. It is therefore important to be able to detect the lactate threshold easily since it will lead to more effective training with less training volume. Another reason for you to be interested in the lactate threshold is the possibility of reducing the risk of overtraining. The knowledge of the lactate threshold can help you not push too hard for too long by finding the optimal training intensities and thereby lower the injury risk. The lactate threshold: A key factor! Maximal oxygen consumption or VO2max is generally accepted as the gold standard measure for aerobic fitness within the field of sports science. However, studies have shown that athletes with similar VO2max have different performance in endurance sports due to different lactate threshold which is why some researchers are suggesting that the lactate threshold is even more important than VO2max. Since the lactate threshold is one of the most important physiological markers, there is no doubt that the lactate threshold is a key factor and an interesting subject for you and for your endurance capacity! The lactate threshold is a very useful tool for you as an athlete. The ability to detect the lactate threshold will help you determine you exercise intensity to improve you aerobic fitness or determine your race pace for your next competition without fatiguing! Kenney, W. L., Wilmore, J. H. & Costill, D. L., 2012. Physiology of Sport and Exercise. 5. ed. s.l. :Human Kinetics. Jeukendrup, A. E., et al. “The Conconi test.” International journal of sports medicine 18.05 (1997): 393-394. Gibala, Martin J., and Sean L. McGee. “Metabolic adaptations to short-term high-intensity interval training: a little pain for a lot of gain?.” Exercise and sport sciences reviews 36.2 (2008): 58-63. Gunnarsson, Thomas Petursson, and Jens Bangsbo. 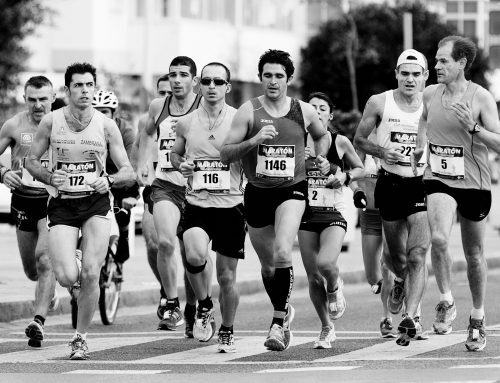 “The 10-20-30 training concept improves performance and health profile in moderately trained runners.” Journal of Applied Physiology113.1 (2012): 16-24. Ghosh AK. Anaerobic Threshold: Its Concept and Role in Endurance Sport. The Malaysian Journal of Medical Sciences : MJMS. 2004;11(1):24-36. Faude, Oliver & Kindermann, Wilfried & Meyer, Tim. (2009). 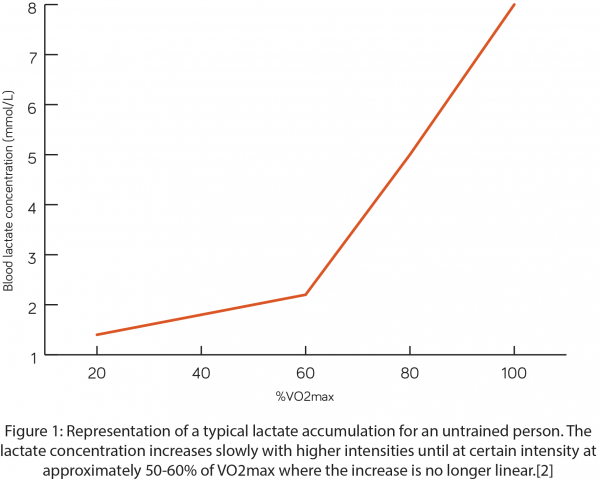 Lactate Threshold Concepts: How Valid are They?. Sports medicine (Auckland, N.Z.). 39. 469-90. Be ready for your next Marathon!